GP38-2 690, Caboose 1258 and GP15-1 101 at Monett, Mo. 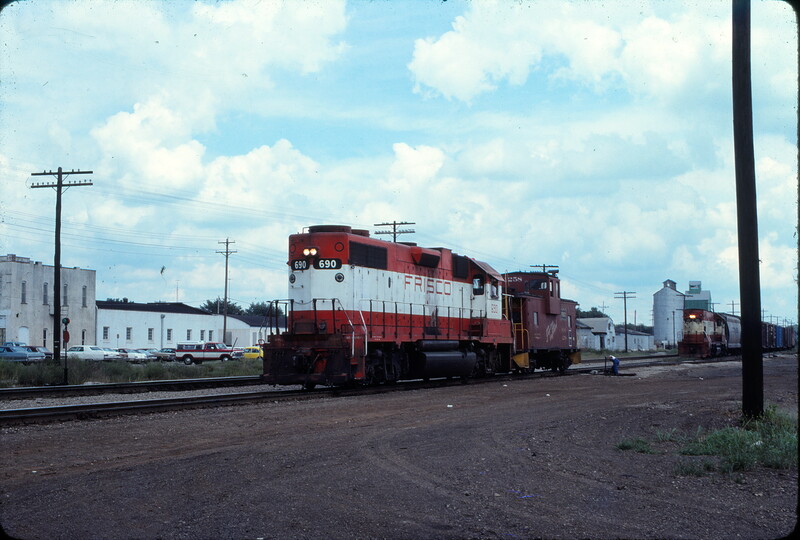 in September 1979. 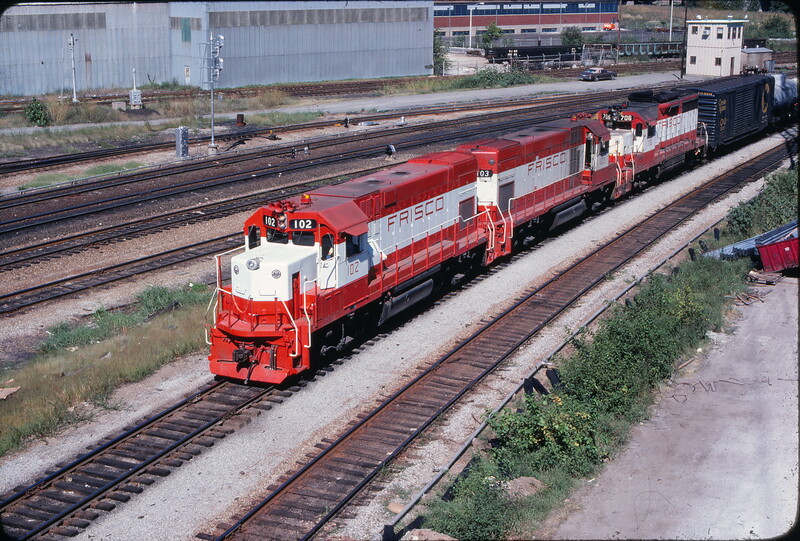 Image was taken just east of the “new” metal replacement depot, MP 282.0. This is south of the main line near the west end of the yard. The locomotive and caboose are accelerating westbound. 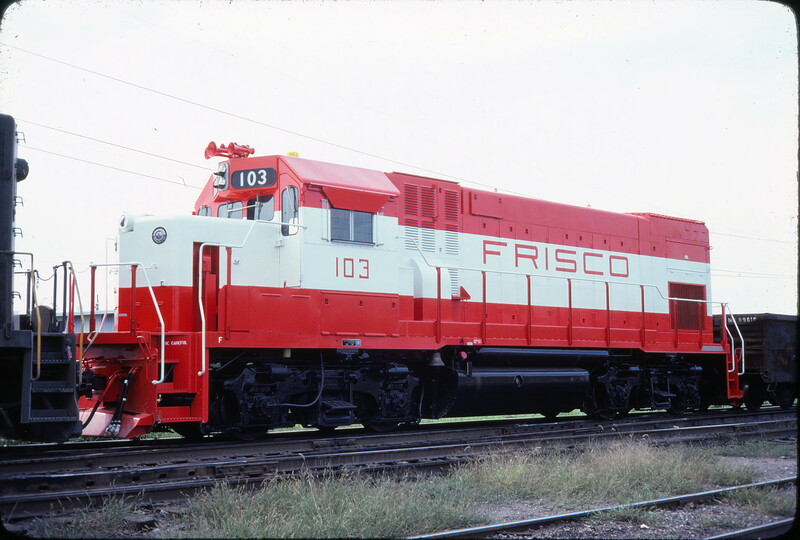 On the far right of the image is another Frisco locomotive with a short local, GP15-1 101. This is south of the former Spanish Mission style stucco passenger depot. The Frisco’s depot address was 403 Front Street. Also on the north side of the tracks were other related railroad buildings along Front Street. 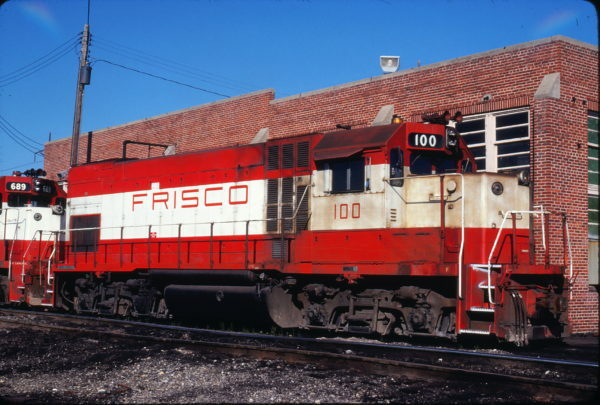 These once included the Express and Baggage (323), the Mail House (415) and Railroad Claim Office (505). Today the only remaining remnants are three of the former depot’s concrete platforms. 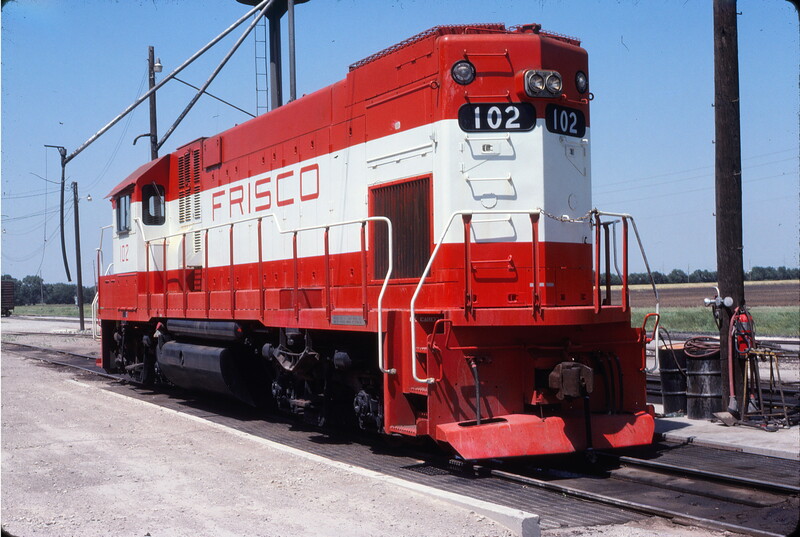 Monett was an important division terminal and junction on the Frisco. To the east is the Springfield Subdivision (Springfield to Monett). To the west is the Cherokee Subdivision (Monett to Tulsa, Oklahoma). To the south is the Fort Smith Subdivision (Monett to Ft. Smith). 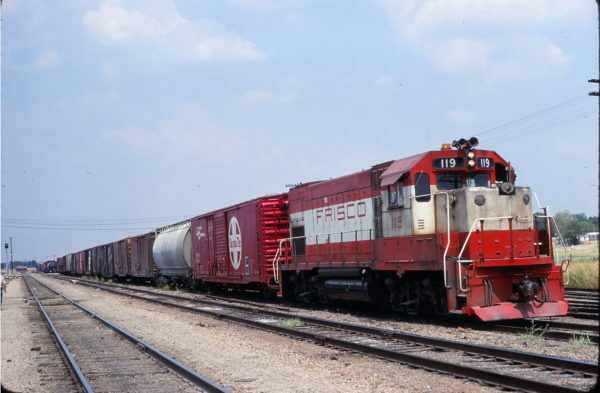 In addition, Carthage Subdivision trains entered the station over the Cherokee Sub from Pierce City, 4.9 miles to the west. The white building on the left is located on the northeast corner of 5th Street and Front Street. The building at one time housed retail stores on the first floor and a hotel above on the second floor. Its address is 101-107 5th Street. In earlier times the Railroad Young Men’s Christian Association (YMCA) building was to the west across 5th Street. To the right is an agriculture supply business. It has changed hands several times over the years. Prior occupants have included Whitlock & Lines Milling Company (1949). At the time of the photograph the business was Aggieville Supply Company. Today the business operates as the Monett Agri-Center and Mac’s Vet Supply. The facility address is 601-611 Front Street. Further in the distance is a 24,000 bushel metal grain storage bin. It is 45’ tall at the lower tank eves, 65’ overall over the head house roof peak. This was part of a larger grain storage and milling complex operated by John F. Meyer & Sons (1910), The Meyer Milling Company (1923) and Whitlock & Lines Milling Company (1949). As of 2017 the grain bin is the only remaining structure of the complex. The facility address was 715-723 Front Street. GP15-1 102 at Wichita, Kansas on June 11, 1978. GP15-1 103 (location unknown) (possibly) in August 1977. 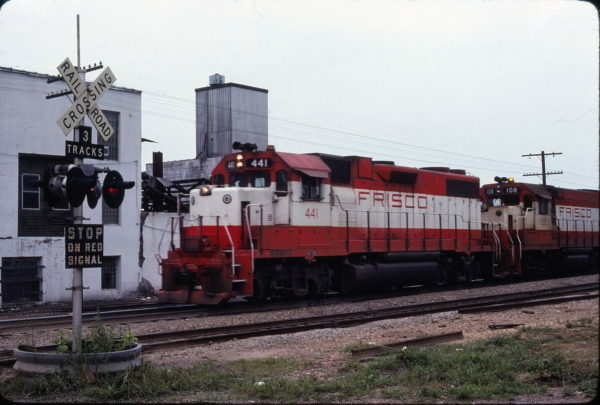 GP38-2 441 and GP15-1 108 at West Plains, Missouri in May 1979 (Ken McElreath). 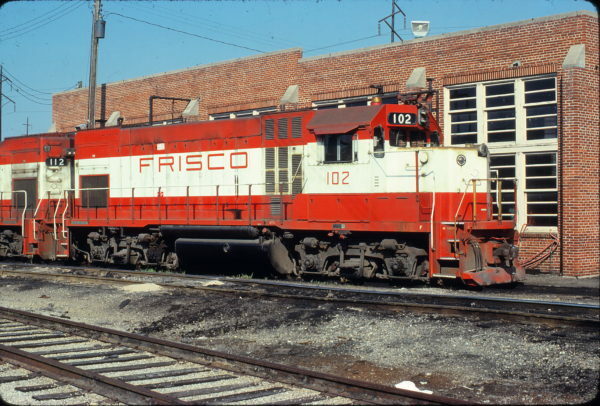 GP15-1 100 at Fort Smith, Arkansas in May 1980 (John Benson). GP15-1 102 at Springfield, Missouri on May 25, 1980 (Allen Clum). 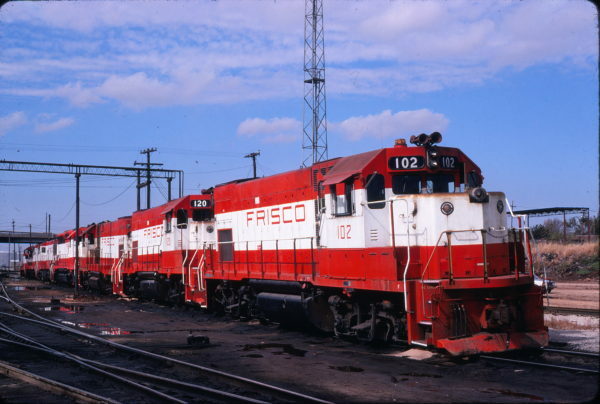 GP15-1s 102 and 120 at Springfield, Missouri on October 17, 1980. The rest of the locomotives in the picture are apparently; GP15-1 115, SD45 943, U25Bs 819 and 811, and SW7 302. 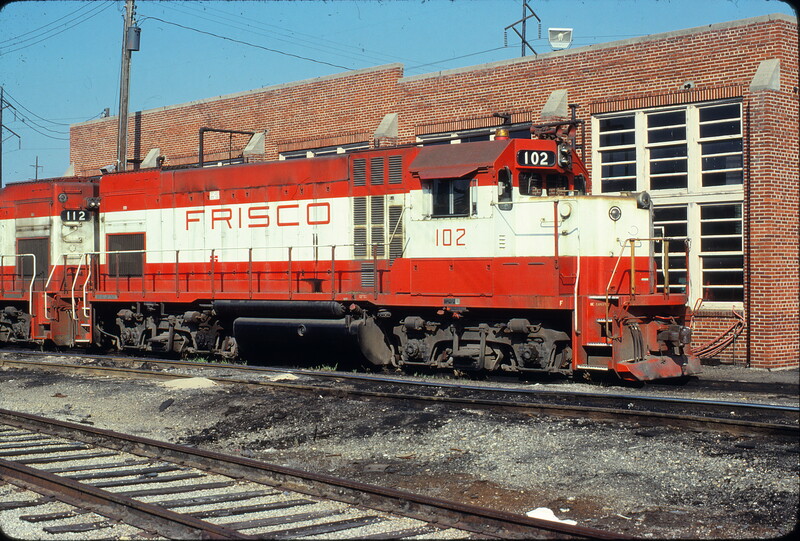 GP15-1 102 at Fort Smith, Arkansas on July 7, 1980 (Paul Strang). 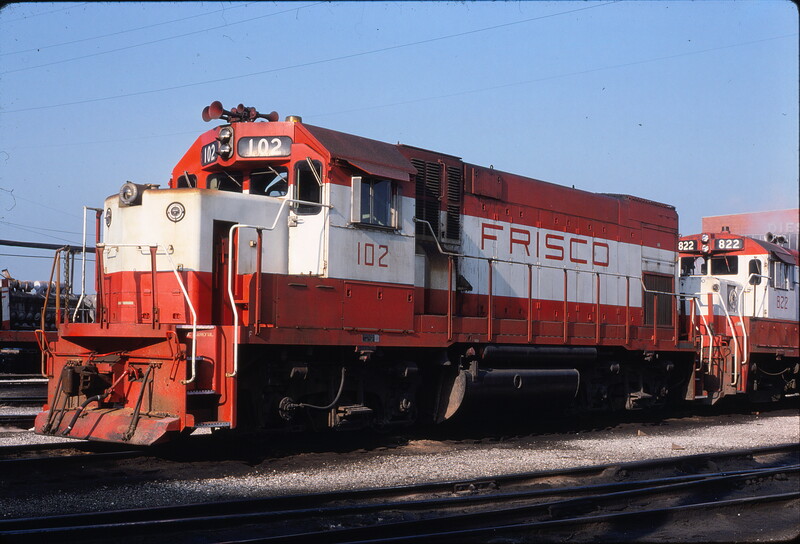 GP15-1 119 at Madill, Oklahoma on August 27, 1980 (Bill Phillips).